North Carolina is a state in the southeastern region of the United States. The state borders South Carolina and Georgia to the south, Tennessee to the west, Virginia to the north, and the Atlantic Ocean to the east. North Carolina is the 28th most extensive and the 9th most populous of the U.S. states. The state is divided into 100 counties. The capital is Raleigh. The most populous municipality is Charlotte, which is the third largest banking center in the United States after New York City and San Francisco. North Carolina consists of three main geographic regions: the Atlantic coastal plain, occupying the eastern portion of the state; the central Piedmont region, and the Mountain region in the west, which is part of the Appalachian Mountains. The coastal plain consists of more specifically-defined areas known as the Outer Banks, a string of sandy, narrow barrier islands separated from the mainland by sounds or inlets, including Albemarle Sound and Pamlico Sound, the tidewater region, the native home of the venus flytrap, and the inner coastal plain, where longleaf pine trees are native. The coastal plain transitions to the Piedmont region along the Atlantic Seaboard fall line, the elevation at which waterfalls first appear on streams and rivers. 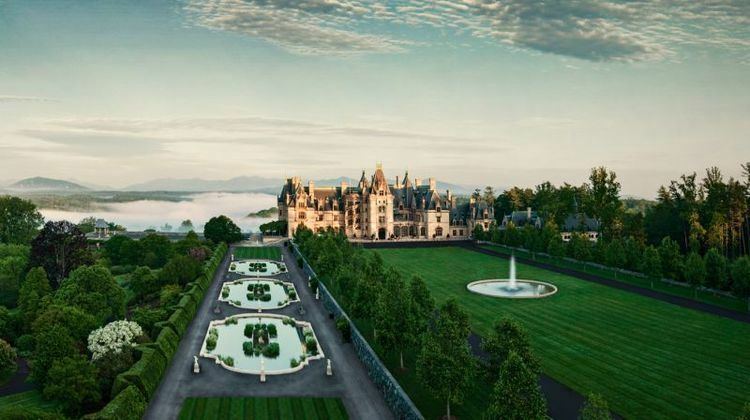 The Piedmont region of central North Carolina is the state's most populous region, containing the six largest cities in the state by population. It consists of gently rolling countryside frequently broken by hills or low mountain ridges. 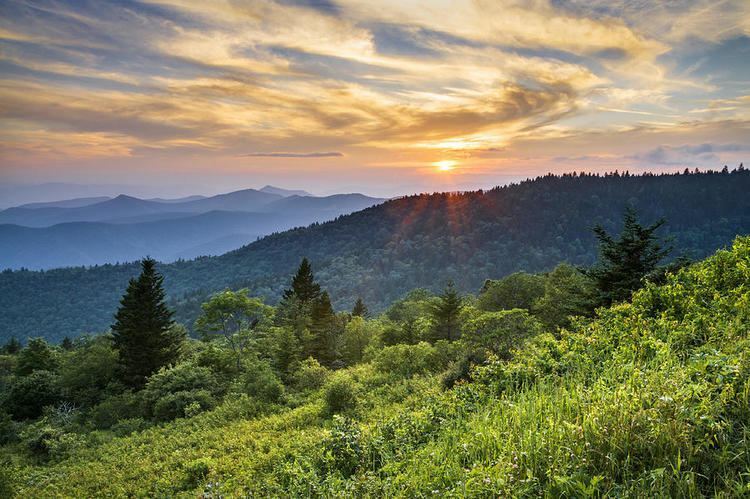 Small, isolated, and deeply eroded mountain ranges and peaks are located in the Piedmont, including the Sauratown Mountains, Pilot Mountain, the Uwharrie Mountains, Crowder's Mountain, King's Pinnacle, the Brushy Mountains, and the South Mountains. The Piedmont ranges from about 300 feet (91 m) in elevation in the east to about 1,500 feet (460 m) in the west. North Carolina has 17 major river basins. The five basins west of the Blue Ridge Mountains flow to the Gulf of Mexico, while the remainder flow to the Atlantic Ocean. Of the 17 basins, 11 originate within the state of North Carolina, but only four are contained entirely within the state's border – the Cape Fear, the Neuse, the White Oak, and the Tar–Pamlico basin. North Carolina experiences severe weather in both summer and winter, with summer bringing threat of hurricanes, tropical storms, heavy rain, and flooding. Destructive hurricanes that have hit North Carolina include Hurricane Fran, Hurricane Floyd, and Hurricane Hazel, the latter being the strongest storm ever to make landfall in the state, as a Category 4 in 1954. Hurricane Isabel ranks as the most destructive of the 21st century. North Carolina averages fewer than 20 tornadoes per year, many of them produced by hurricanes or tropical storms along the coastal plain. Tornadoes from thunderstorms are a risk, especially in the eastern part of the state. The western Piedmont is often protected by the mountains, which tend to break up storms as they try to cross over; the storms will often re-form farther east. A phenomenon known as "cold-air damming" often occurs in the northwestern part of the state, which can weaken storms but can also lead to major ice events in winter. In April 2011, the worst tornado outbreak in North Carolina's history occurred. Thirty confirmed tornadoes touched down, mainly in the Eastern Piedmont and Sandhills, killing at least 24 people. Woodland-culture American Indians were in the area around 1000 BCE; starting around 750 CE, Mississippian-culture Indians created larger political units with stronger leadership and more stable, longer-term settlements. During this time, important buildings were constructed as pyramidal, flat-topped buildings. By 1550, many groups of American Indians lived in present-day North Carolina, including Chowanoke, Roanoke, Pamlico, Machapunga, Coree, Cape Fear Indians, Waxhaw, Waccamaw, and Catawba. In June 1718, the pirate Blackbeard ran his flagship, the Queen Anne's Revenge, aground at Beaufort Inlet, North Carolina, in present-day Carteret County. After the grounding her crew and supplies were transferred to smaller ships. In November, after appealing to the governor of North Carolina, who promised safe-haven and a pardon, Blackbeard was killed in an ambush by troops from Virginia. In 1996 Intersal, Inc., a private firm, discovered the remains of a vessel likely to be the Queen Anne's Revenge, which was added to the US National Register of Historic Places. North Carolina became one of the English Thirteen Colonies and with the territory of South Carolina was originally known as the Province of Carolina. The northern and southern parts of the original province separated in 1729. Originally settled by small farmers, sometimes having a few slaves, who were oriented toward subsistence agriculture, the colony lacked cities or towns. Pirates menaced the coastal settlements, but by 1718 the pirates had been captured and killed. Growth was strong in the middle of the 18th century, as the economy attracted Scots-Irish, Quaker, English and German immigrants. The colonists generally supported the American Revolution, as the number of Loyalists was smaller than in some other colonies. During colonial times, Edenton served as the state capital beginning in 1722, and New Bern was selected as the capital in 1766. Construction of Tryon Palace, which served as the residence and offices of the provincial governor William Tryon, began in 1767 and was completed in 1771. In 1788 Raleigh was chosen as the site of the new capital, as its central location protected it from coastal attacks. Officially established in 1792 as both county seat and state capital, the city was named after Sir Walter Raleigh, sponsor of Roanoke, the "lost colony" on Roanoke Island. After 1800, cotton and tobacco became important export crops. The eastern half of the state, especially the Tidewater region, developed a slave society based on a plantation system and slave labor. Many free people of color migrated to the frontier along with their European-American neighbors, where the social system was looser. By 1810, nearly 3 percent of the free population consisted of free people of color, who numbered slightly more than 10,000. The western areas were dominated by white families, especially Scots-Irish, who operated small subsistence farms. In the early national period, the state became a center of Jeffersonian and Jacksonian democracy, with a strong Whig presence, especially in the West. After Nat Turner's slave uprising in 1831, North Carolina and other southern states reduced the rights of free blacks. In 1835 the legislature withdrew their right to vote. Democrats were elected to the legislature and governor's office, but the Populists attracted voters displeased with them. In 1896 a biracial, Populist-Republican Fusionist coalition gained the governor's office. The Democrats regained control of the legislature in 1896 and passed laws to impose Jim Crow and racial segregation of public facilities. Voters of North Carolina's 2nd congressional district elected a total of four African-American congressmen through these years of the late 19th century. Political tensions ran so high that a small group of white Democrats in 1898 planned to take over the Wilmington government if their candidates were not elected. In the Wilmington Insurrection of 1898, more than 1,500 white men attacked the black newspaper and neighborhood, killed numerous men, and ran off the white Republican mayor and aldermen. They installed their own people and elected Alfred M. Waddell as mayor, in the only coup d'état in United States history. In 1899 the state legislature passed a new constitution, with requirements for poll taxes and literacy tests for voter registration which disfranchised most black Americans in the state. Exclusion from voting had wide effects: it meant that black Americans could not serve on juries or in any local office. After a decade of white supremacy, many people forgot that North Carolina had ever had thriving middle-class black Americans. Black citizens had no political voice in the state until after the federal Civil Rights Act of 1964 and Voting Rights Act of 1965 were passed to enforce their constitutional rights. It was not until 1992 that another African American was elected as a US Representative from North Carolina. As in the rest of the former Confederacy, North Carolina had become a one-party state, dominated by the Democratic Party. Impoverished by the Civil War, the state continued with an economy based on tobacco, cotton and agriculture. Towns and cities remained few in the east. A major industrial base emerged in the late 19th century in the western counties of the Piedmont, based on cotton mills established at the fall line. Railroads were built to connect the new industrializing cities. The state was the site of the first successful controlled, powered and sustained heavier-than-air flight, by the Wright brothers, near Kitty Hawk on December 17, 1903. In the first half of the 20th century, many African Americans left the state to go North for better opportunities, in the Great Migration. Their departure changed the demographic characteristics of many areas. North Carolina was hard hit by the Great Depression, but the New Deal programs of Franklin D. Roosevelt for cotton and tobacco significantly helped the farmers. After World War II, the state's economy grew rapidly, highlighted by the growth of such cities as Charlotte, Raleigh, and Durham in the Piedmont. Raleigh, Durham, and Chapel Hill form the Research Triangle, a major area of universities and advanced scientific and technical research. In the 1990s, Charlotte became a major regional and national banking center. 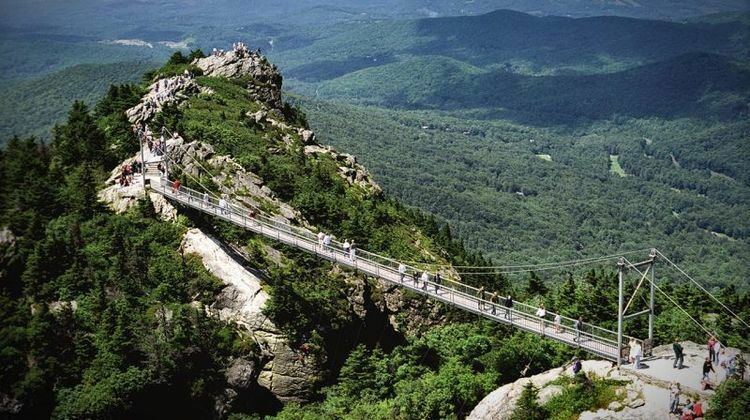 Tourism has also been a boon for the North Carolina economy as people flock to the Outer Banks coastal area and the Appalachian Mountains anchored by Asheville. North Carolina was inhabited for thousands of years by succeeding cultures of prehistoric indigenous cultures. Before 200 AD, they were building earthwork mounds, which were used for ceremonial and religious purposes. Succeeding peoples, including those of the ancient Mississippian culture established by 1000 AD in the Piedmont, continued to build or add on to such mounds. In the 500–700 years preceding European contact, the Mississippian culture built large, complex cities and maintained far-flung regional trading networks. Its largest city was Cahokia, located in present-day Illinois near the Mississippi River. Spanish explorers traveling inland in the 16th century met Mississippian culture people at Joara, a regional chiefdom near present-day Morganton. Records of Hernando de Soto attested to his meeting with them in 1540. In 1567 Captain Juan Pardo led an expedition to claim the area for the Spanish colony and to establish another route to protect silver mines in Mexico. Pardo made a winter base at Joara, which he renamed Cuenca. His expedition built Fort San Juan and left a contingent of 30 men there, while Pardo traveled further, and built and garrisoned five other forts. He returned by a different route to Santa Elena on Parris Island, South Carolina, then a center of Spanish Florida. In the spring of 1568, natives killed all but one of the soldiers and burned the six forts in the interior, including the one at Fort San Juan. Although the Spanish never returned to the interior, this effort marked the first European attempt at colonization of the interior of what became the United States. A 16th-century journal by Pardo's scribe Bandera and archaeological findings since 1986 at Joara have confirmed the settlement. In 1584, Elizabeth I granted a charter to Sir Walter Raleigh, for whom the state capital is named, for land in present-day North Carolina (then part of the territory of Virginia). It was the second American territory which the English attempted to colonize. Raleigh established two colonies on the coast in the late 1580s, but both failed. The fate of the "Lost Colony" of Roanoke Island remains one of the most widely debated mysteries of American history. Virginia Dare, the first English child to be born in North America, was born on Roanoke Island on August 18, 1587; Dare County is named for her. As early as 1650, settlers from the Virginia colony moved into the area of Albemarle Sound. By 1663, King Charles II of England granted a charter to start a new colony on the North American continent; it generally established North Carolina's borders. He named it Carolina in honor of his father Charles I. By 1665, a second charter was issued to attempt to resolve territorial questions. 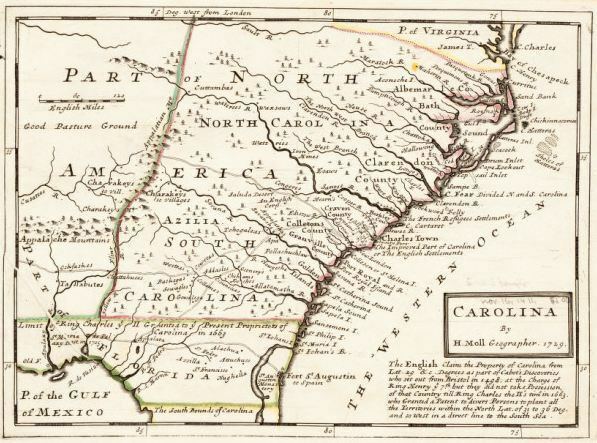 In 1710, owing to disputes over governance, the Carolina colony began to split into North Carolina and South Carolina. The latter became a crown colony in 1729. In the 1700s, a series of smallpox epidemics swept the South, causing high fatalities among the Native Americans, who had no immunity to the new disease (it had become endemic in Europe). According to the historian Russell Thornton, "The 1738 epidemic was said to have killed one-half of the Cherokee, with other tribes of the area suffering equally." After the Spanish in the 16th century, the first permanent European settlers of North Carolina were English colonists who migrated south from Virginia. The latter had grown rapidly and land was less available. Nathaniel Batts was documented as one of the first of these Virginian migrants. He settled south of the Chowan River and east of the Great Dismal Swamp in 1655. By 1663, this northeastern area of the Province of Carolina, known as the Albemarle Settlements, was undergoing full-scale English settlement. During the same period, the English monarch Charles II gave the province to the Lords Proprietors, a group of noblemen who had helped restore Charles to the throne in 1660. The new province of "Carolina" was named in honor and memory of King Charles I (Latin: Carolus). In 1712, North Carolina became a separate colony. Except for the Earl Granville holdings, it became a royal colony seventeen years later. A large revolt happened in the state in 1711 known as Cary's Rebellion. Differences in the settlement patterns of eastern and western North Carolina, or the Low Country and uplands, affected the political, economic, and social life of the state from the 18th until the 20th century. The Tidewater in eastern North Carolina was settled chiefly by immigrants from rural England and the Scottish Highlands. The upcountry of western North Carolina was settled chiefly by Scots-Irish, English, and German Protestants, the so-called "cohee". Arriving during the mid- to late 18th century, the Scots-Irish from what is today Northern Ireland were the largest non-English immigrant group before the Revolution; English indentured servants were overwhelmingly the largest immigrant group before the Revolution. 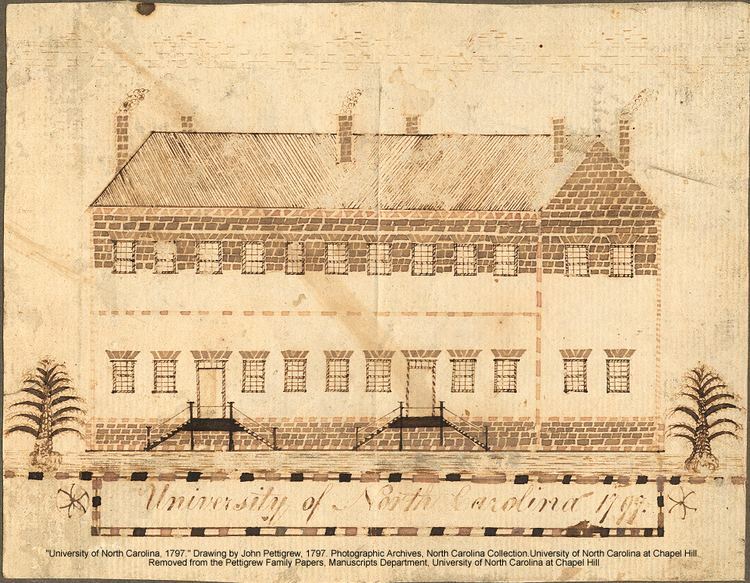 During the American Revolutionary War, the English and Highland Scots of eastern North Carolina tended to remain loyal to the British Crown, because of longstanding business and personal connections with Great Britain. The English, Welsh, Scots-Irish, and German settlers of western North Carolina tended to favor American independence from Britain. Most of the English colonists had arrived as indentured servants, hiring themselves out as laborers for a fixed period to pay for their passage. In the early years the line between indentured servants and African slaves or laborers was fluid. Some Africans were allowed to earn their freedom before slavery became a lifelong status. Most of the free colored families formed in North Carolina before the Revolution were descended from unions or marriages between free white women and enslaved or free African or African-American men. Because the mothers were free, their children were born free. Many had migrated or were descendants of migrants from colonial Virginia. As the flow of indentured laborers to the colony decreased with improving economic conditions in Great Britain, planters imported more slaves, and the state's legal delineations between free and slave status tightened, effectively hardening the latter into a racial caste. The economy's growth and prosperity was based on slave labor, devoted first to the production of tobacco. On April 12, 1776, the colony became the first to instruct its delegates to the Continental Congress to vote for independence from the British Crown, through the Halifax Resolves passed by the North Carolina Provincial Congress. The dates of both of these events are memorialized on the state flag and state seal. Throughout the Revolutionary War, fierce guerrilla warfare erupted between bands of pro-independence and pro-British colonists. In some cases the war was also an excuse to settle private grudges and rivalries. A major American victory in the war took place at King's Mountain along the North Carolina–South Carolina border; on October 7, 1780, a force of 1000 mountain men from western North Carolina (including what is today the state of Tennessee) and southwest Virginia overwhelmed a force of some 1000 British troops led by Major Patrick Ferguson. Most of the soldiers fighting for the British side in this battle were Carolinians who had remained loyal to the Crown (they were called "Tories" or Loyalists). The American victory at Kings Mountain gave the advantage to colonists who favored American independence, and it prevented the British Army from recruiting new soldiers from the Tories. The road to Yorktown and America's independence from Great Britain led through North Carolina. As the British Army moved north from victories in Charleston and Camden, South Carolina, the Southern Division of the Continental Army and local militia prepared to meet them. Following General Daniel Morgan's victory over the British Cavalry Commander Banastre Tarleton at the Battle of Cowpens on January 17, 1781, southern commander Nathanael Greene led British Lord Charles Cornwallis across the heartland of North Carolina, and away from the latter's base of supply in Charleston, South Carolina. This campaign is known as "The Race to the Dan" or "The Race for the River." In the Battle of Cowan's Ford, Cornwallis met resistance along the banks of the Catawba River at Cowan's Ford on February 1, 1781, in an attempt to engage General Morgan's forces during a tactical withdrawal. Morgan had moved to the northern part of the state to combine with General Greene's newly recruited forces. Generals Greene and Cornwallis finally met at the Battle of Guilford Courthouse in present-day Greensboro on March 15, 1781. Although the British troops held the field at the end of the battle, their casualties at the hands of the numerically superior Continental Army were crippling. Following this "Pyrrhic victory", Cornwallis chose to move to the Virginia coastline to get reinforcements, and to allow the Royal Navy to protect his battered army. This decision would result in Cornwallis' eventual defeat at Yorktown, Virginia, later in 1781. The Patriots' victory there guaranteed American independence. On November 21, 1789, North Carolina became the twelfth state to ratify the Constitution. In 1840, it completed the state capitol building in Raleigh, still standing today. Most of North Carolina's slave owners and large plantations were located in the eastern portion of the state. Although North Carolina's plantation system was smaller and less cohesive than that of Virginia, Georgia, or South Carolina, significant numbers of planters were concentrated in the counties around the port cities of Wilmington and Edenton, as well as suburban planters around the cities of Raleigh, Charlotte, and Durham in the Piedmont. Planters owning large estates wielded significant political and socio-economic power in antebellum North Carolina, which was a slave society. They placed their interests above those of the generally non-slave-holding "yeoman" farmers of western North Carolina. In mid-century, the state's rural and commercial areas were connected by the construction of a 129-mile (208 km) wooden plank road, known as a "farmer's railroad", from Fayetteville in the east to Bethania (northwest of Winston-Salem). In 1860, North Carolina was a slave state, in which one-third of the population was enslaved. This was a smaller proportion than in many Southern states. The state did not vote to join the Confederacy until President Abraham Lincoln called on it to invade its sister state, South Carolina, becoming the last or second-to-last state to officially join the Confederacy. The title of "last to join the Confederacy" has been disputed; although Tennessee's informal secession on May 7, 1861, preceded North Carolina's official secession on May 20, the Tennessee legislature did not formally vote to secede until June 8, 1861. North Carolina was the site of few battles, but it provided the Confederacy with at least 125,000 troops, which is far more than any other state did. Approximately 40,000 of those troops died: more than half of disease, the remainder from battlefield wounds and from starvation. North Carolina also supplied about 15,000 Union troops. Elected in 1862, Governor Zebulon Baird Vance tried to maintain state autonomy against Confederate President Jefferson Davis in Richmond. After secession, some North Carolinians refused to support the Confederacy. Some of the yeoman farmers in the state's mountains and western Piedmont region remained neutral during the Civil War, while some covertly supported the Union cause during the conflict. Approximately 2,000 North Carolinians from western North Carolina enlisted in the Union Army and fought for the North in the war. Two additional Union Army regiments were raised in the coastal areas of the state, which were occupied by Union forces in 1862 and 1863. Numerous slaves escaped to Union lines, where they became essentially free. Confederate troops from all parts of North Carolina served in virtually all the major battles of the Army of Northern Virginia, the Confederacy's most famous army. The largest battle fought in North Carolina was at Bentonville, which was a futile attempt by Confederate General Joseph Johnston to slow Union General William Tecumseh Sherman's advance through the Carolinas in the spring of 1865. In April 1865, after losing the Battle of Morrisville, Johnston surrendered to Sherman at Bennett Place, in what is today Durham. North Carolina's port city of Wilmington was the last Confederate port to fall to the Union, in February 1865, after the Union won the nearby Second Battle of Fort Fisher, its major defense downriver. The first Confederate soldier to be killed in the Civil War was Private Henry Wyatt from North Carolina, in the Battle of Big Bethel in June 1861. At the Battle of Gettysburg in July 1863, the 26th North Carolina Regiment participated in Pickett/Pettigrew's Charge and advanced the farthest into the Northern lines of any Confederate regiment. During the Battle of Chickamauga, the 58th North Carolina Regiment advanced farther than any other regiment on Snodgrass Hill to push back the remaining Union forces from the battlefield. At Appomattox Court House in Virginia in April 1865, the 75th North Carolina Regiment, a cavalry unit, fired the last shots of the Confederate Army of Northern Virginia in the Civil War. For many years, North Carolinians proudly boasted that they had been "First at Bethel, Farthest at Gettysburg and Chickamauga, and Last at Appomattox." The United States Census Bureau estimates that the population of North Carolina was 10,146,788 on July 1, 2016, a 6.4% increase since the 2010 United States Census. Of the people residing in North Carolina, 58.5% were born in North Carolina, 33.1% were born in another US state, 1.0% were born in Puerto Rico, U.S. Island areas, or born abroad to American parent(s), and 7.4% were born in another country. As of 2011, 49.8% of North Carolina's population younger than age 1 were minorities. As of 2011, 49.8% of North Carolina's population younger than age 1 were minorities (meaning that they had at least one parent who was not non-Hispanic white). As of 2010, 89.66% (7,750,904) of North Carolina residents age 5 and older spoke English at home as a primary language, while 6.93% (598,756) spoke Spanish, 0.32% (27,310) French, 0.27% (23,204) German, and Chinese (which includes Mandarin) was spoken as a main language by 0.27% (23,072) of the population over the age of five. In total, 10.34% (893,735) of North Carolina's population age 5 and older spoke a mother language other than English. While the Baptists in total (counting both blacks and whites) have maintained the majority in this part of the country (known as the Bible Belt), the population in North Carolina practices a wide variety of faiths, including Judaism, Islam, Baha'i, Buddhism, and Hinduism. As of 2010 the Southern Baptist Church was the biggest denomination, with 4,241 churches and 1,513,000 members; the second largest was the United Methodist Church, with 660,000 members and 1,923 churches. The third was the Roman Catholic Church, with 428,000 members in 190 congregations. The fourth greatest was the Presbyterian Church (USA), with 186,000 members and 710 congregations; this denomination was brought by Scots-Irish immigrants who settled the backcountry in the colonial era. In 2016, the US Census Bureau released 2015 population estimate counts for North Carolina's counties. Mecklenburg County has the largest population, while Wake County has the second largest population in North Carolina. In 2016, the US Census Bureau released 2015 population estimate counts for North Carolina's cities with populations above 70,000. Charlotte has the largest population, while Raleigh has the highest population density of North Carolina's largest cities. North Carolina has a very diverse economy because of its great availability of hydroelectric power, its pleasant climate, and its wide variety of soils. The state ranks third among the South Atlantic states in population, but leads the region in industry and agriculture. North Carolina leads the nation in the production of tobacco, textiles, and furniture. Charlotte, the state's largest city, is a major textile and trade center. According to a Forbes article written in 2013 Employment in the "Old North State" has gained many different industry sectors. See the following article summary: science, technology, energy and math, or STEM, industries in the area surrounding North Carolina's capital have grown 17.9 percent since 2001, placing Raleigh-Cary at No. 5 among the 51 largest metro areas in the country where technology is booming. In 2010 North Carolina's total gross state product was $424.9 billion, while the state debt in November 2012, according to one source, totalled US$2.4bn, while according to another, was in 2012 US$57.8bn. In 2011 the civilian labor force was at around 4.5 million with employment near 4.1 million. The working population is employed across the major employment sectors. The economy of North Carolina covers 15 metropolitan areas. In 2010, North Carolina was chosen as the third-best state for business by Forbes Magazine, and the second-best state by Chief Executive Officer Magazine. North Carolina is the leading US state in production of flue-cured tobacco and sweet potatoes, and is second in production of pigs and hogs, trout, and turkeys. In the three most recent USDA surveys (2002, 2007, 2012), North Carolina also ranked second in Christmas tree production. Based on American Community Survey 2010-2014 data, North Carolina's median household income was $46,693. It ranked forty first out of fifty states plus the District of Columbia for median household income. North Carolina had the fourteenth highest poverty rate in the nation at 17.6%. 13% of families were below the poverty line. Since 2000, there has been a clear division in the economic growth of North Carolina's urban and rural areas. While North Carolina's urban areas have enjoyed a prosperous economy with steady job growth, low unemployment, and rising wages, many of the state's rural counties have suffered from job loss, rising levels of poverty, and population loss as their manufacturing base has declined. According to one estimate, one-half of North Carolina's 100 counties have lost population since 2010, primarily due to the poor economy in many of North Carolina's rural areas. However, the population of the state's urban areas is steadily increasing. North Carolina's airports serve destinations throughout the United States and international destinations in Canada, Europe, Central America, and the Caribbean. In 2013 Charlotte Douglas International Airport ranked as the 23rd busiest airport in the world. North Carolina has a growing passenger rail system with Amtrak serving most major cities. Charlotte is also home to North Carolina's only light rail system known as the Lynx. North Carolina's party loyalties have undergone a series of important shifts in the last few years: While the 2010 midterms saw Tar Heel voters elect a bicameral Republican majority legislature for the first time in over a century, North Carolina has also become a Southern swing state in presidential races. Since Southern Democrat Jimmy Carter's comfortable victory in the state in 1976, the state had consistently leaned Republican in presidential elections until Democrat Barack Obama narrowly won the state in 2008. In the 1990s, Democrat Bill Clinton came within a point of winning the state in 1992 and also only narrowly lost the state in 1996. In the early 2000s, Republican George W. Bush easily won the state by over 12 points, but by 2008, demographic shifts, population growth, and increased liberalization in heavily populated areas such as the Research Triangle, Charlotte, Greensboro, Winston-Salem, Fayetteville, and Asheville, propelled Barack Obama to victory in North Carolina, the first Democrat to win the state since 1976. In 2012, North Carolina was again considered a competitive swing state, with the Democrats even holding their 2012 Democratic National Convention in Charlotte. However, Republican Mitt Romney ultimately eked out a 2-point win in North Carolina, the only 2012 swing state that Obama lost, and one of only two states (along with Indiana) to flip from Obama in 2008 to the GOP in 2012. In 2012, the state elected a Republican Governor (Pat McCrory) and Lieutenant Governor (Dan Forest) for the first time in more than two decades, while also giving the Republicans veto-proof majorities in both the State House of Representatives and the State Senate. Several U.S. House of Representatives seats also flipped control, with the Republicans holding nine seats to the Democrats' four. In the 2014 mid-term elections, Republican David Rouzer won the state's Seventh Congressional District seat, increasing the congressional delegation party split to 10-3 in favor of the GOP. Elementary and secondary public schools are overseen by the North Carolina Department of Public Instruction. The North Carolina Superintendent of Public Instruction is the secretary of the North Carolina State Board of Education, but the board, rather than the superintendent, holds most of the legal authority for making public education policy. In 2009, the board's chairman also became the "chief executive officer" for the state's school system. North Carolina has 115 public school systems, each of which is overseen by a local school board. A county may have one or more systems within it. The largest school systems in North Carolina are the Wake County Public School System, Charlotte-Mecklenburg Schools, Guilford County Schools, Winston-Salem/Forsyth County Schools, and Cumberland County Schools. In total there are 2,425 public schools in the state, including 99 charter schools. North Carolina Schools were segregated until the Brown v. Board of Education trial and the release of the Pearsall Plan. North Carolina is home to three major league sports franchises: the Carolina Panthers of the National Football League and the Charlotte Hornets of the National Basketball Association are based in Charlotte, while the Raleigh-based Carolina Hurricanes play in the National Hockey League. The Panthers and Hurricanes are the only two major professional sports teams that have the same geographical designation while playing in different metropolitan areas. The Hurricanes are the only major professional team from North Carolina to have won a league championship, having captured the Stanley Cup in 2006. North Carolina is also home to two other top-level professional teams in less prominent sports—the Charlotte Hounds of Major League Lacrosse and the North Carolina Courage of the National Women's Soccer League. Golf is a popular summertime leisure activity, and North Carolina has hosted several important professional golf tournaments. Pinehurst Resort in Pinehurst has hosted a PGA Championship, Ryder Cup, two U.S. Opens, and one U.S. Women's Open. The Wells Fargo Championship is a regular stop on the PGA Tour and is held at Quail Hollow Club in Charlotte, while the Wyndham Championship is played annually in Greensboro. College sports are also popular in North Carolina, with 18 schools competing at the Division I level. The Atlantic Coast Conference (ACC) is headquartered in Greensboro, and both the ACC Football Championship Game (Charlotte) and the ACC Men's Basketball Tournament (Greensboro) were most recently held in North Carolina. College basketball in particular is very popular, buoyed by the Tobacco Road rivalries between Duke, North Carolina, North Carolina State, and Wake Forest. The ACC Championship Game and the Belk Bowl are held annually in Charlotte's Bank of America Stadium, featuring teams from the ACC and the Southeastern Conference. Additionally, the state has hosted the NCAA Men's Basketball Final Four on two occasions, in Greensboro in 1974 and in Charlotte in 1994. In Raleigh many tourists visit the Capital, African American Cultural Complex, Contemporary Art Museum of Raleigh, Gregg Museum of Art & Design at NCSU, Haywood Hall House & Gardens, Marbles Kids Museum, North Carolina Museum of Art, North Carolina Museum of History, North Carolina Museum of Natural Sciences, North Carolina Sports Hall of Fame, Raleigh City Museum, J. C. Raulston Arboretum, Joel Lane House, Mordecai House, Montfort Hall, and the Pope House Museum. The Carolina Hurricanes NHL hockey team is also located in the city. The Piedmont Triad, or center of the state, is home to Krispy Kreme, Mayberry, Texas Pete, the Lexington Barbecue Festival, and Moravian cookies. The internationally acclaimed North Carolina Zoo in Asheboro attracts visitors to its animals, plants, and a 57-piece art collection along five miles of shaded pathways in the world's largest-land-area natural-habitat park. 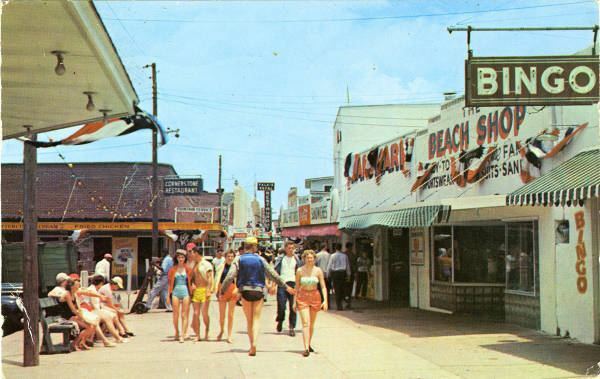 Seagrove, in the central portion of the state, attracts many tourists along Pottery Highway (NC Hwy 705). MerleFest in Wilkesboro attracts more than 80,000 people to its four-day music festival; and Wet 'n Wild Emerald Pointe water park in Greensboro is another attraction. The mainland northeastern part of the state, having recently adopted the name the Inner Banks, is also known as the Albemarle Region, for the Albemarle Settlements, some of the first settlements on North Carolina's portion of the Atlantic Coastal Plain. The regions historic sites are connected by the Historic Albemarle Tour. The Research Triangle area has long been a well-known center for folk, rock, metal, jazz and punk. James Taylor grew up around Chapel Hill, and his 1968 song "Carolina in My Mind" has been called an unofficial anthem for the state. Other famous musicians from North Carolina include J. Cole, Shirley Caesar, Roberta Flack, Clyde McPhatter, Nnenna Freelon, Warren Haynes, Jimmy Herring, Michael Houser, Eric Church, Future Islands, Randy Travis, Ryan Adams, Ronnie Milsap, Anthony Hamilton, The Avett Brothers and Luke Combs. Metal and punk acts such as Corrosion of Conformity, Between the Buried and Me, and Nightmare Sonata are native to North Carolina. In the mountains, the Brevard Music Center hosts choral, orchestral, and solo performances during its annual summer schedule. North Carolina has a variety of shopping choices. SouthPark Mall in Charlotte is currently the largest in the Carolinas, with almost 2.0 million square feet. Other major malls in Charlotte include Northlake Mall and Carolina Place Mall in nearby suburb Pineville. Other major malls throughout the state include Hanes Mall in Winston-Salem; Crabtree Valley Mall, North Hills Mall, and Triangle Town Center in Raleigh; Friendly Center and Four Seasons Town Centre in Greensboro; Oak Hollow Mall in High Point; Concord Mills in Concord; Valley Hills Mall in Hickory; Cross Creek Mall in Fayetteville; and The Streets at Southpoint and Northgate Mall in Durham and Independence Mall in Wilmington, North Carolina, and Tanger Outlets in Charlotte, Nags Head, Blowing Rock, and Mebane, North Carolina. 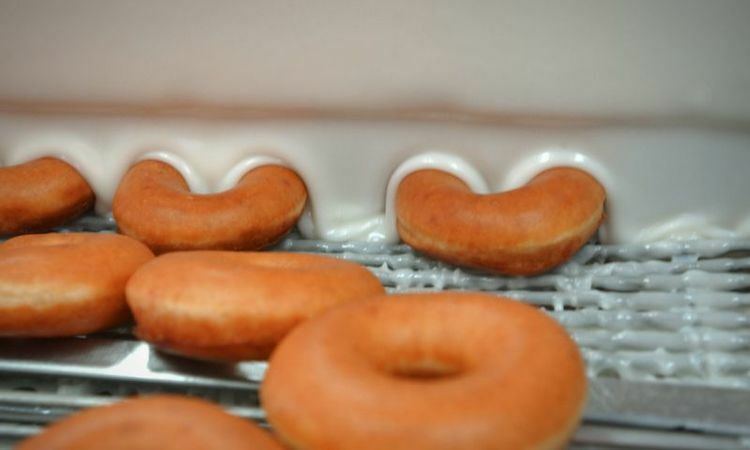 Krispy Kreme, an international chain of doughnut stores, was started in North Carolina; the company's headquarters are in Winston-Salem. Pepsi-Cola was first produced in 1898 in New Bern. A regional soft drink, Cheerwine, was created and is still based in the city of Salisbury. Despite its name, the hot sauce Texas Pete was created in North Carolina; its headquarters are also in Winston-Salem. The Hardee's fast-food chain was started in Rocky Mount. Another fast-food chain, Bojangles', was started in Charlotte, and has its corporate headquarters there. 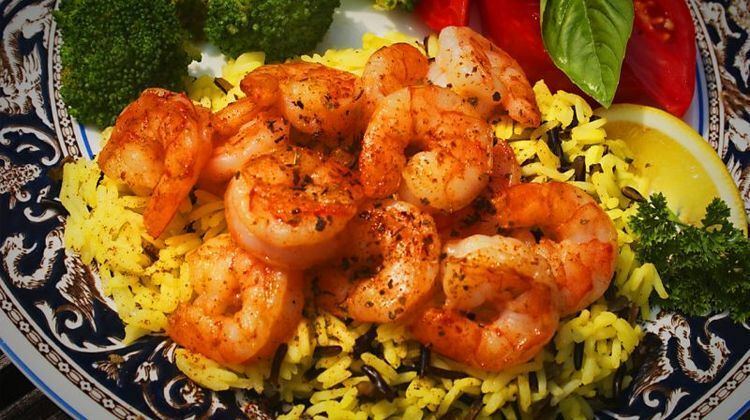 A popular North Carolina restaurant chain is Golden Corral. Started in 1973, the chain was founded in Fayetteville, with headquarters located in Raleigh. Popular pickle brand Mount Olive Pickle Company was founded in Mount Olive in 1926. Fast casual burger chain Hwy 55 Burgers, Shakes & Fries also makes its home in Mount Olive. Cook Out, a popular fast-food chain featuring burgers, hot dogs, and milkshakes in a wide variety of flavors, was founded in Greensboro in 1989 and has begun expanding outside of North Carolina. In 2013, Southern Living named Durham – Chapel Hill the South's "Tastiest City."